Swansea produced a high-class display to beat Brentford 3-0 and revive their faint Championship play-offs hopes. Nathan Dyer scored his first Swansea league goals in almost five years as Graham Potter's team beat Brentford for the third time this season. Dyer's opener, inside a minute, was one of the fastest goals scored at the Liberty Stadium and he added a second before the interval. Daniel James' second-half strike clinched a comfortable victory. The Swans halted a four-game losing streak with the win over the Bees and are now 14th, below 13th-placed Brentford on goal difference with both teams 10 points off the play-off spots. The Welsh club would appear to have more chance of making the top six given that they have a game in hand on Thomas Frank's team, although it would take a memorable late-season run for either side to get there. These two sides had produced a couple of compelling games already this season. Swansea won 3-2 at Griffin Park in the Championship in December, when they went 3-0 up inside 27 minutes but were clinging on for victory by the end. In the FA Cup fifth round, Brentford went ahead only for James to inspire Swansea to a 4-1 victory. James had terrorised the Bees on a memorable afternoon back in February, and the flying winger need less than a minute to make a mark here. James stole the ball from Brentford defender Henrik Dalsgaard before racing through on goal. Bees goalkeeper Luke Daniels brought James down on the edge of the box, but Nathan Dyer was on hand to tap home his first league goal for since August 2014. Dyer's simple finish was a very early reward for another display which was full of promise as Swansea finally added a cutting edge to their impressive build-up play. Brentford are another team capable of playing eye-catching football, but spent most of the first half chasing white shirts as Graham Potter's young team turned on the style. James curled one shot against the crossbar before Swansea doubled their lead in uncharacteristically direct fashion. 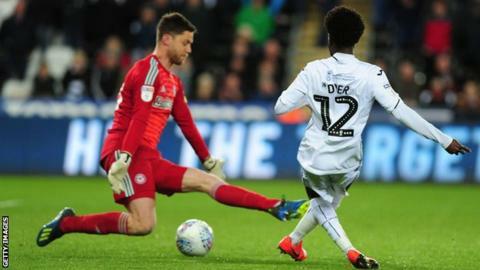 Swansea keeper Kristoffer Nordfeldt fired the ball long into the path of Dyer and he strolled in behind the visitors' defence before rolling in his second goal of the night. Having waited 1,676 days to score in the league for Swansea - he did net once while on loan at Leicester - Dyer achieved the feat twice in 33 minutes. Swansea were in total control, and hit the woodwork once more before the break through Bersant Celina's free-kick. Brentford came back into the game a little in the second period but failed to create any clear-cut chances. After Celina was denied when one-on-one with Daniels, James delivered the knockout blow. The 21-year-old, who is becoming more influential by the week, steered in his fourth Swansea goal of the season after Connor Roberts' shot had come back off the post. "The performance, especially in the first half, was of a really high level. We showed real courage - we took another step forward and I'm really pleased for the players because we've had some pain as you can imagine. "Against a team like Brentford it's never comfortable. They attack as well as anybody in the league. They didn't have too many chances against us so I felt it was a real good defensive effort from everybody. "I'm proud of the players. They stuck together through a sticky spell and they got their rewards tonight. "Now we focus on the next match and on trying to get as many points as we can between now and the end of the season." "Today the first half performance was bad in every aspect. I don't care if you concede an early goal, you have to be better. "You could say we are tired as a squad, but for me it's all in the head. We have to be ready and not get emotionally frustrated. "I think what Swansea did well compared to us was use their pace in behind, especially with [Daniel] James. He's a good player and makes a big difference. "He has the potential to be a Premier League player, but I hope Swansea can keep him." Match ends, Swansea City 3, Brentford 0. Second Half ends, Swansea City 3, Brentford 0. Oliver McBurnie (Swansea City) wins a free kick on the right wing. Offside, Brentford. Ollie Watkins tries a through ball, but Henrik Dalsgaard is caught offside. Attempt saved. Courtney Baker-Richardson (Swansea City) right footed shot from outside the box is saved in the bottom right corner. Assisted by Oliver McBurnie. Offside, Swansea City. Wayne Routledge tries a through ball, but Connor Roberts is caught offside. Attempt blocked. Romaine Sawyers (Brentford) right footed shot from outside the box is blocked. Assisted by Moses Odubajo. Offside, Swansea City. Wayne Routledge tries a through ball, but Courtney Baker-Richardson is caught offside. Substitution, Swansea City. Cameron Carter-Vickers replaces Daniel James. Attempt missed. Neal Maupay (Brentford) right footed shot from outside the box is close, but misses to the right. Assisted by Henrik Dalsgaard. Goal! Swansea City 3, Brentford 0. Daniel James (Swansea City) right footed shot from the centre of the box to the bottom left corner. Connor Roberts (Swansea City) hits the left post with a right footed shot from the centre of the box. Assisted by Oliver McBurnie. Henrik Dalsgaard (Brentford) is shown the yellow card. George Byers (Swansea City) wins a free kick in the defensive half. Substitution, Swansea City. Courtney Baker-Richardson replaces Nathan Dyer. Substitution, Swansea City. Oliver McBurnie replaces Bersant Celina. Foul by Mads Bech Sörensen (Brentford). Corner, Brentford. Conceded by Connor Roberts. Emiliano Marcondes (Brentford) wins a free kick on the right wing. Foul by Kyle Naughton (Swansea City).